Ever heard the term mommys little helper? Well, these preschool cooking activities are to encourage your toddler or preschooler to be a happy helper in the kitchen. 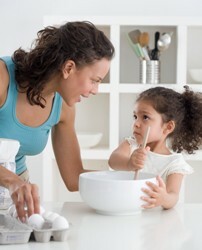 The best way to encourage a happy kitchen helper is to allow your toddler to be part of the daily meal preparation. Some moms make the mistake of only scheduling fun activities when their preschooler can take part in cooking and baking. Fun activities are good (there are some just below) but I encourage you to let your toddler sit in on the meal preparations that happen daily. For a long time my children enjoyed decorating plain biscuits or cup cakes. You need a selection of 100s and 1000s, chocolate vermicelli, Smarties or M Ms. Mix a little icing sugar with a drop of food colouring and some water. Let them spoon the icing onto the cookie or cup cake and then decorate. Making pizza faces for a lunch time meal is also fun. You can decorate a plain Magherita pizza with olives (eyes), banana or red sweet pepper (mouth) and wedges of pineapple (nose). I often keep a stock of cookie mixture in the fridge so that I can defrost it on the morning that my children want to bake. The mixing of the cookie dough is often a messy business especially if you have lots of little ones so this minimises stress on baking day. Mix all the ingredients together  this is a stiff dough and some elbow grease is needed. Wrap half in plastic wrap and freeze and use the other half in a week. Roll out and cut with cookie cutters. Bake at 180 deg Celsius for 10  12 minutes. From the time my children were small I used to prop them up in their bouncing chair to chat to them at supper time. When they were a little older I used to keep a special box of activities for them to work on while I was busy cooking. This box stayed in the kitchen and they worked on the activities at the same counter I was working at. We would chat and I would direct their activity. When they were older I would have them sit with me as I cooked and they listened to story tapes while they peeled or chopped, depending on their age. My children are now aged 13  6 and suppertime preparation is still something we do together. I know not all moms like to cook and sometimes, especially if there is a new baby in the house, bulk cooking or doing the meal while everyone is having an afternoon nap is preferable, but I do encourage you to use this time to build relationship with your toddlers and preschoolers. I do encourage you to visit www.kids-cooking-activities.com for a more detailed approach on building your pre-schoolers cooking skills and for lots more preschool cooking activities.